Northwestern University’s McCormick School of Engineering and Applied Science celebrated the graduation of its accomplished master’s and PhD students on Monday, Dec. 15. Held in the Technological Institute’s Ryan Family Auditorium, the event marked the first time McCormick has conducted a ceremony for its December graduates, recognizing 120 master’s students and 13 PhD students. The ceremony featured Brenda Dietrich, IBM fellow and vice president. She talked about how data and access to information has changed since she earned her PhD in 1984. Throughout the past century, she said, information was found at the library. Now it’s everywhere, and it’s searchable and accessible at any time of day, from anywhere in the world. Because of that, the roles of experts and scholars have changed, no longer focused on remembering information. Now experts continually search for new information, create new information, and find insights by connecting disparate pieces of information. 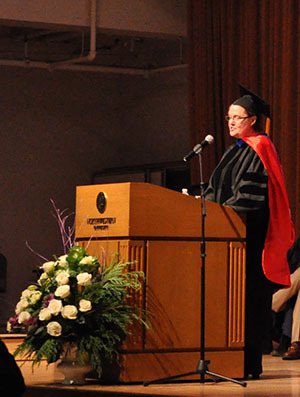 In parting, Ottino congratulated the graduates and urged them to maintain connections to McCormick.